I just had a ‘near miss’ experience with something I thought was going to lead me to a simulator used for marketing a product (‘product simulation marketing’, as I call it). Do you see the “Simulator” link on the right side of the ad (in the middle)? The requested URL /simulator/samsung/droid_charge/simulator.html was not found on this server. 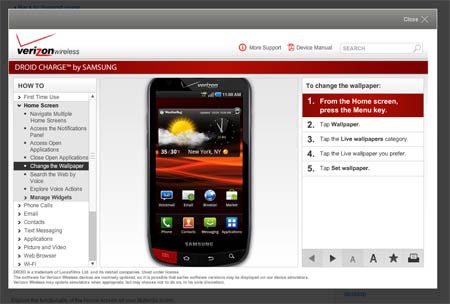 It was an instructional tutorial for doing various tasks on the Samsung Charge. From a training perspective, it clearly said how to do each function, but I feel this kind of training could benefit from more interactivity (rather than push this, push that). This presentation was clearly designed as a training aid, but I wonder if the link from the banner ad went to the same area. For some time, I have been talking about re-purposing training material as marketing material. However, I think the verbatim use (just using the exact same thing) would not be the right approach. Training/support is about teaching skills and solving problems at a detailed level, whereas in a marketing application, I think there would be more of a tie-in to the whole experience (like a case study) and at a higher (less detailed) level, giving the viewer the confidence he/she can solve the problem, not necessarily taking all the detailed steps. Again, maybe there is a marketing simulator lurking somewhere that would address these higher-level concerns but in the context of interactive use. If anyone does come across such a presentation, please let me know — I would love to see what they’ve done as distinct from the training content.